A traditional "1,000-meter-long banquet" was held recently in southwest China's Chongqing Municipality as locals welcome the incoming Lunar New Year. More than 50,000 Chinese and overseas tourists were among the guests served local delicacies at the banquet along a street in Chongqing's Zhongshan Old Town. The street's households were decorated with red lanterns, while sweet wine, baked glutinous rice cakes and smoked tofu lined the shops. Tables of food were placed in the street to welcome visitors. Yang Guangxiang was busy serving the dishes at the banquet. Each time, the 61-year-old carried nine dishes in a 2-meter-long, 20-cm-wide wooden basin over his head and quickly placed the dishes on the tables. "Bravo!" The crowd said as they went wild watching the old fellow serve the dishes. 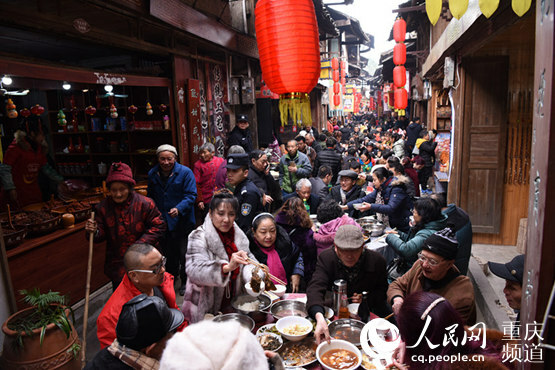 Residents of the town traditionally hold these banquets to welcome the Spring Festival, which falls on Feb. 5 this year. In the past, the town was a busy port, and locals would prepare food along the street to cater to business people and porters who could not make it home for family gatherings. 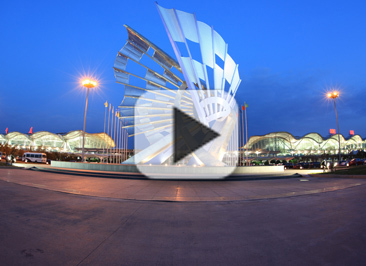 In 2005, locals decided to boost local tourism by resuming the tradition. Each year, on weekends before the Spring Festival, families cook their best dishes outside their homes to entertain visitors.